On a small hill, overlooking the town of Foxton, stands the beautiful historic church of St Mary’s. This gem of a church, under the protection of Mother Mary and the Brigidine charism, is there as a visible sign of God’s grace and faith found in humanity. 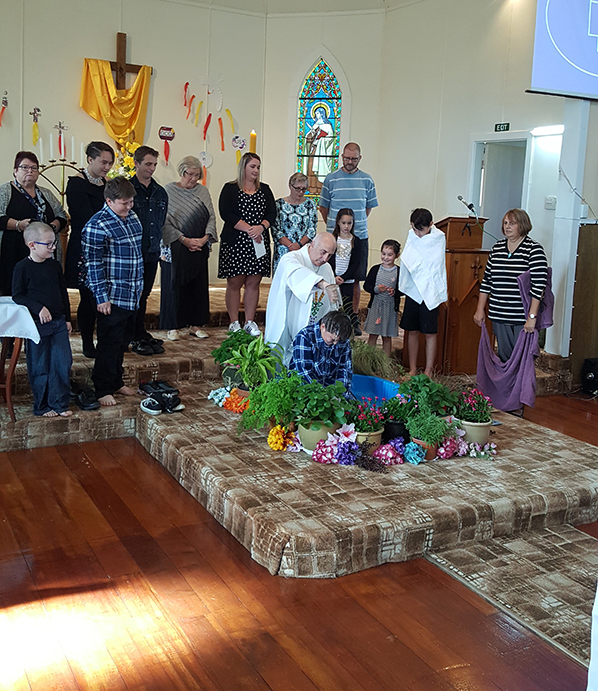 During the season of the Resurrection of Christ, on Sunday 15 April, five children – Katherine, Shaun, Cyrus, Ollie and Ryein – received Baptism and Holy Communion from Fr Joe Grayland. Both Sacraments showed God’s grace as the life-giving water was poured over the children to share in the Resurrection. They were blessed by the Oil of Catechumens, strengthening them towards a life with Christ. The children changed into white garments to show they had put on Christ. I pray our children will have Jesus by their side for life. That they will always forgive themselves and others and that they will forever know that God’s love is in them. In the light of the new document from Pope Francis, Gaudete et Exsultate, these children and their families can ‘rejoice and be glad’ they can learn to be true to themselves through the power of these Sacraments. Mary Kleinsman-Powell is Principal/DRS St Mary’s School, Hāto Maira o Te Awahou.